Colombia's coffee region set amidst the rugged hills between Medellin, Cali and Ibague produces some of the finest coffee in the world. Besides learning how the coffee is made, you can experience stunning national parks, vibrant cities, and quiet pueblos. We're spilling the beans with some expert tips on getting around the region and the best places to visit. 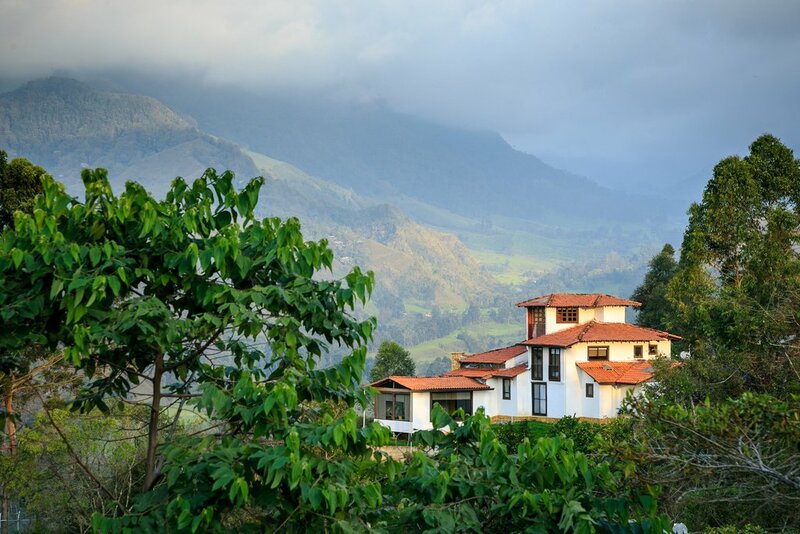 Unwind and relax in Pijao, South America's first designated "slow town"
Colombia's Coffee region (also called the Coffee Axis or in Spanish, Eje Cafetero) spans three departments: Caldas, Risaralda and Quindío. Visiting the area is similar to a tour of the Wine Country in northern California: you can visit coffee plantations as you would wineries, touring the fields and sampling the finished product. Many of the farms supplement their income with tourism and will offer detailed showing how the coffee is picked, produced and readied for export. This guide will direct you to the best places to see the coffee production process, the best times to visit the area, as well as places to stay and when to visit. The Coffee Region has three medium-sized cities plus a smattering of smaller towns and villages nestled amid the green valleys and connected by narrow country roads. The best places to visit in the region are often tiny pueblos surrounded by coffee farms, but there's also bigger cities where you can experience excellent museums and cultural events. In addition to plantation tours, the region has a number of other unique attractions and activities. You can visit stunning nature reserves and waterfalls or go mountain biking and canyoning. Colombia's peak travel seasons are June to August and December to January, as these months align with the holidays for both international as well as domestic travelers (the weather in Colombia is quite similar year-round). Expect larger crowds during peak times, especially between December and January. Prices for hotels and flights during these months also increase. Other times of the year see fewer tourists and lower prices for accommodation, making the off-season a good time to visit. The most interesting period to visit is during coffee harvest season, from April to May or October to December. The farms will be at the most active during this period, making for some excellent photo opportunities. January - Feria de Manizales: A major celebration lasting most of the month with a locally inspired program including bullfights, cultural music and dance performances, horse parades and artisan exhibitions. June - Fiesta Nacional de Cafe: or the annual Coffee Festival features the most famous jeep parades (Yipao) in Colombia. Visitors will experience the marvel of coffee jeeps loaded to capacity and proving themselves with feats of prowess and strength to showcase the stability and culture surrounding the Jeep Willy. A must see for travelers who are traveling in this month. August - Fiestas de las Cosechas: this event includes an annual parade, an International Gastronomic Festival, concerts, local musicians, art exhibits and street markets featuring local products. September - Festivo de Sabores, Sonidos y Saberes: in Pijao is dedicated to fresh coffee, local food and regional culture in an area that is developing their own unique infrastructure. December - Concurso Nacional de Velas y Faroles: is a Christmas celebration lit by beautiful paper lanterns. Located in the pueblo of Quimbaya, where the streets will be filled with lanterns carefully prepared by the local populace for months ahead of time. Be sure to plan a night stay if you attend as crowds are large and chaotic for this famous yet beautiful event. 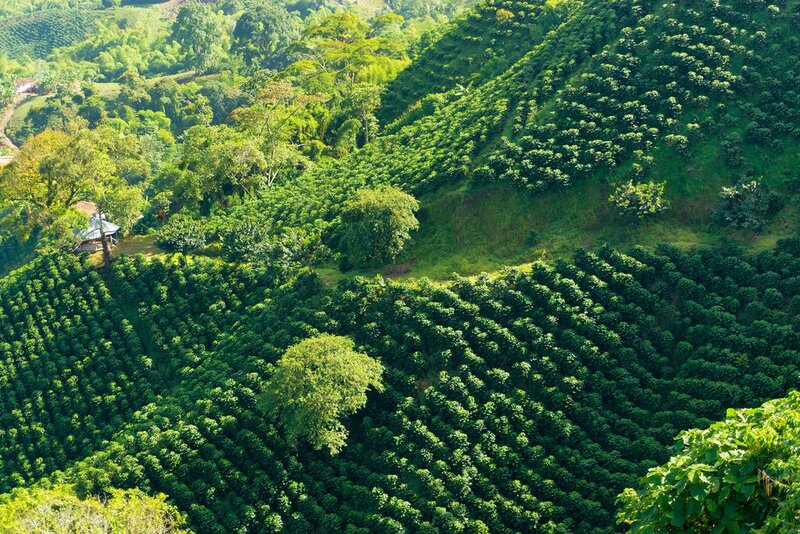 To see all the highlights of Colombia's coffee region, you'll need around 7-8 days. If time is a factor, you can still plan a great experience in 2-3 days where you can spend a night on a coffee farm and visit Salento and Valle Cocora. 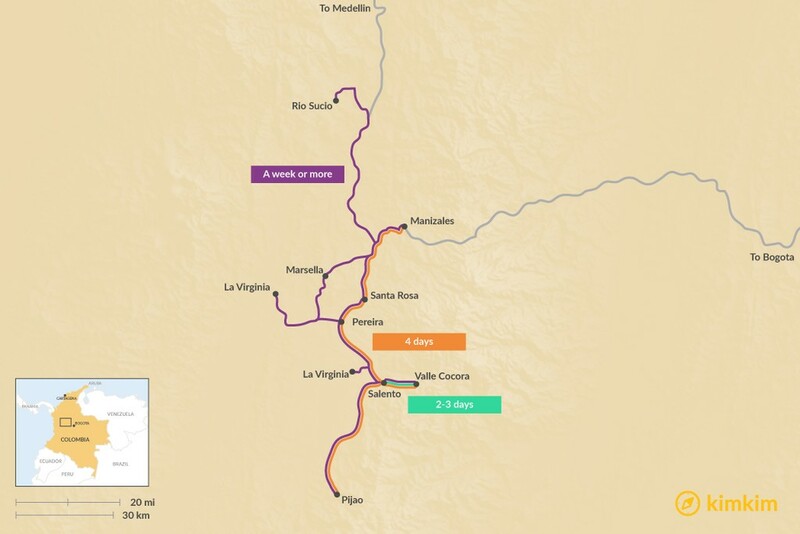 With four days, you could then add on Pijao, Santa Rosa, Manizales, and Pereira. With a week or more, you could then include Rio Sucio, Marsella, La Virginia and Filandia to your itinerary. Private vans to Pereira (in the heart of the region) take 4-5 hours From Medellín. Public buses also depart frequently during the day. VivaColombia offers flights between these two cities. 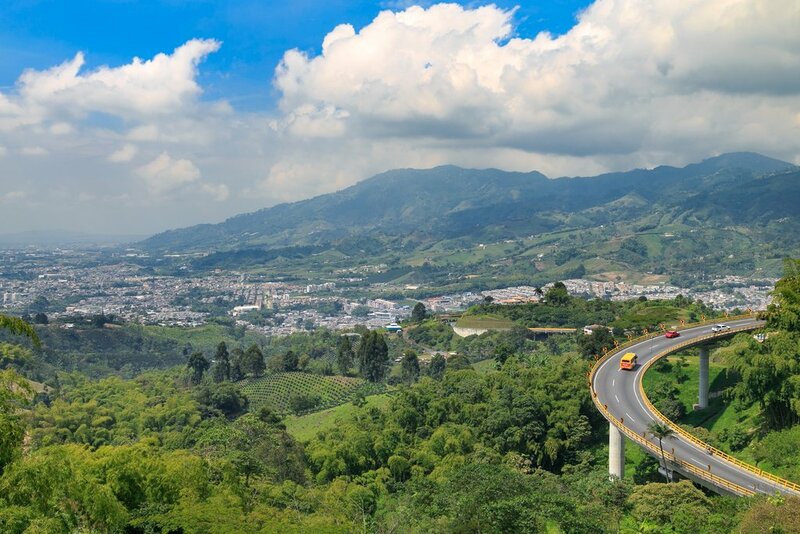 The trip to Pereira from Bogotá by bus is a long haul, taking 8-9 hours, especially when crossing La Linea, a mountain pass that tops 10,000 feet above sea level. Bus drivers run the air conditioning all the time, so bring a blanket! By car, you could arrive within 6-8 hours depending on visibility, road conditions, and traffic. Tour operators can arrange a car, driver, and guide to meet you at your hotel, from where you can set off for the main sites. With your own car, you can cross the entire region in one long day (but better to take your time). With the exception of Rio Sucio, most destinations within the region can be reached within 1-2 hours from Pereira. Road conditions are generally good, although many of the mountain roads can make for difficult driving. A guide and driver are a good idea in this area as public transportation to the coffee farms and nature reserves is infrequent or non-existent. Flights from are available from Bogotá and Medellín to the main cities in the area — Pereira, Manizales, and Armenia. Flights out of Manizales tend to be less reliable due to frequent cancellations caused by low clouds and poor visibility. Pereira often experiences turbulence and visibility seems to be lower more frequently, due to climate change affecting normal weather patterns. However, the Pereira airport has plans for upgrades and expansion. Be sure to arrive at least an hour early for national departures and two hours early for international flights. Colombia's Coffee region has a range of great boutique hotel options. You an stay in the big cities (Manizales, Pereira, and Armenia), but to get a better feel for the area and its history and culture, we recommend staying overnight in the smaller towns, such as Solento and Filandia. In these pueblos, you'll find homey accommodation in renovated farmhouses and colonial-era homes. These days, many coffee plantations (as well as farms growing other produce) offer accommodation, with old haciendas and guest quarters transformed into hotels that cater for guests. Besides offering unique and comfortable lodging, they also offer activities such as horse riding, jeep tours, and bird watching. 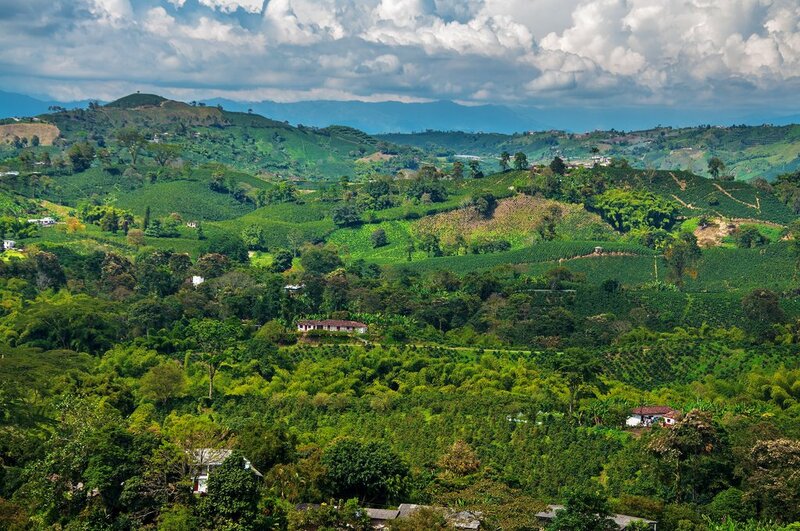 One of the best known is Hacienda Venecia is one of the oldest and most well-established coffee farms in the region. Today you can stay in the original, fully-restored plantation house where you will get a feel for the traditional architecture and culture of this region. The single most famous local dish in the Coffee Region is "Bandeja Paisa, " or the Paisa Flag. This colorful dish was designed for the farm worker. It is high in protein, carbs and fat to support the needs of the hard work and rugged terrain. Today, it is a delicacy reserved for special occasions. The plate consists of chorizo, ground beef, beans, rice, avocado, a fried egg, fried plantain, and arepa. If you are a light eater, this is usually a good plate to split between two people. This was our first experience in Colombia and with KimKim. We worked with Nicolas while before our trip and he was very prompt and accurate in providing the detail level of information as well as customizing the entire trip for us. The entire trip went very flawless and smooth as planned and committed. One thing to consider and be patient with is that there are several companies involved in the service chain including the KimKim, their domestic office, their local agent and their subcontractor which might make it a bit complicated but they planned all well. For example the driver picked us up on time from airport however he did not know the person who we had made the reservations, but everything went great. The driver Anderson in charge of all transportation for the entire trip was fantastic, although he did speak almost none to minimum English, made every attempt to understand us and specially my limited Spanish. The Coffee farm tour at Santiago's farm was amazing, the tour, lunch and their hospitality was amazing. Also the Cocora Valley and Finlandia tour guide Alberto was extremely knowledgeable and great company for the entire day. Overall we were very pleased with the tour and highly recommend KimKIm company for Colombia and Zonacafetera visit. At the end thank you Nicolas for this wonderful memory and experience. I am really glad I went with KimKim to book our trip in Colombia. Gael, our trip specialist, took care of all the little trip-planning details that would have taken me days of research and indecision to figure out. We ended up going to the Coffee Region, and our itinerary included staying at a coffee finca with great amenities, hiking in the Cocora valley, visiting charming towns along the way, eating farm-to-table, and of course drinking amazing coffee with our local guides Sebastian and Santiago. We also floated lazily down a river in a bamboo raft for an afternoon. The landscape just seems untouched out there, it was really a treat! I was feeling a bit ill from the altitude on one of the days, and the local guides took really good care of me. Our trip to Colombia was excellent. We had a wonderful time in the coffee region and the trip organized by Gael and Tucaya was a lot of fun and seamless. We had a few minor snags while booking the trip, as we were originally booked on a return flight that did not leave enough time to catch our connecting international flight, but we were able to switch our flights after bringing this up with Gael. Gael was very helpful with suggesting activities and excursions for us, all of which proved very enjoyable. Once in Colombia, we corresponded with Nicholas at Tucaya via WhatsApp and he was very helpful. He promptly responded to any inquiry and made sure to check in with us in the mornings and evenings to recap the day and preview the next day's activities. On the ground in the coffee region, everything worked very smoothly. We had driver's and tour guides waiting for us at the appointed times without issues, the hotel (Finca Bosque del Saman) was beautifully picturesque, and our activities were great. 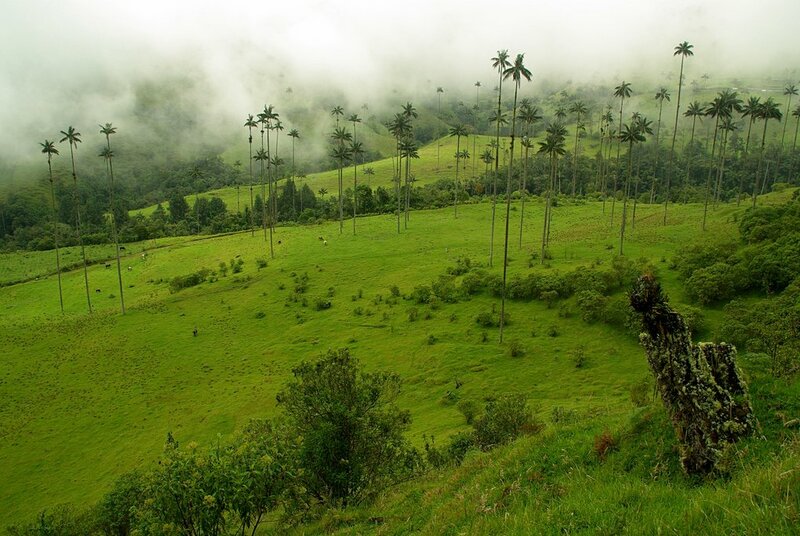 One day, we to Filandia, Salento, and the Cocora Valley with our tour guide Sebastian. Not only were these areas beautiful, but Sebastian is an amazing and thoughtful guide who took us both to the main tourist attractions but also took us off the beaten path to local coffee shops and restaurants. Cafe Jesus Martin in Salento and restaurant Helena Adentro in Filandia were highlights. We can't recommend Sebastian enough. Another day, we visited Finca Casa Vieja, a coffee plantation run by a local family. Santiago, one of the owners, gave us a wonderful tour of the farm (which grows many types of fruits and flowers in addition to coffee), as well as a look inside the coffee making process. After a delicious lunch prepared by Santiago's aunt (using produce from the farm), we visited the family's coffee shop in Quimbaya, Cafe de Altura, where we sampled many different preparations of coffee as well as some baked goods prepared by Alejandra, Santiago's sister. Sebastian, our tour guide from the day before, also joined us for coffee, which was a pleasure. To cap the afternoon, we took a bamboo raft down Rio de la Vieja, which offered great views and some fun swimming opportunities. The main downside to this trip was that we were only in the coffee region for a few days. We certainly plan to visit Colombia again and would be happy to book through Gael and Kim Kim again, as we had a great trip that went seamlessly after we got everything booked properly.